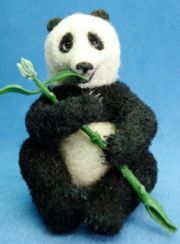 This column spotlights emerging talent from three-dimensional fiber artists, specializing in the medium of Needle Felting - focusing on those demonstrating ingenuity and advanced mastery of this newer segment of the teddy bear world. There is no more appropriate time than a New Year to present a new artist! I’ll correct that to read—an artist who has tackled and mastered a new skill in less than a year. Tammy Martin has been using her hands and mind in a winning combination since she was a youngster, and I’ve learned that her six children, as avid students of Mom’s hobbies, are benefiting from this. Frankly, I also expect her to be a Time Wizard, who has yet to let us in on her secrets of fitting 38 of her hours into every 24 of ours. Besides being Mother of six, ranging from their late 20s down to four year old twins, she is a full-time orthopedic surgeon, with subspecialty training in Sports Medicine and Foot & Ankle surgery. 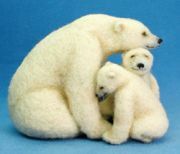 Other skills that she’s tackled and achieved proficiency in are netsuke carving, Raggedy Anne doll making, jewelry making, pottery, macramé, medical illustration, drawing, oil painting, basket weaving, regular jointed mini mohair bears (and now, newly-added MINK bears! ), knitting, crochet, macro photography, dabbling in ProSculpt polymer clay design: “Just easy stuff, nothing fancy, nothing too exciting….” Tammy claims!! 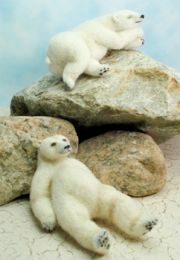 exclusive features of her bears are the hand-shaped and individually inserted, micro-mini claws, an unusual feat that carries out the realistic composition. There are many who needle felt in miniature; the true mark of a master craftsman is to design in the subtle shapes and implied movements that bring her work to life—while staying within the correct scale proportions. realistic is her goal – an ever evolving challenge! For now, she also enjoys discovering different sheep breeds and the limitless possibilities they offer. Tammy is an avid collector of all things miniature; each item in her extensive collection has at least one aspect that captivates her. 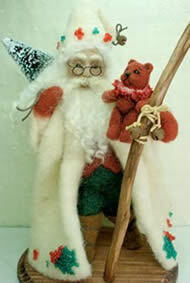 The mediums include wool fiber, crochet & knitting, polymer clay, wood and most other unique artists’ materials. 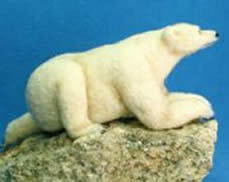 If Tammy had her way, she’d become an unofficial Peace Ambassador throughout the world, bringing a spectacular work of her Needle Felted art to each country’s leader, in the form of a miniature bear, while learning about and sharing the lifestyles of people around the world and linking them together through Art. She does travel annually now, throughout some of the poorer areas of the world, helping to teach and surgically correct some of the anomalies that are more routinely and easily handled in here. Though there are still many goals she wants to accomplish with her Needle Felting, she enthusiastically hopes the ‘Highs’ are all still to come! 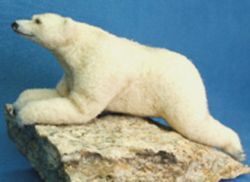 In the past, this type of specialty work was available only at bear shows, through magazine features and in specialty bear and miniaturists’ shops. Today the Internet has added to those venues: as close to each of us as the computer monitor on the desk in front of us. We have access to artists and collectors from all corners of the globe, to meet each other, share experiences and acquire incredible works of art formerly impossible to find without much time and travel expense. Perhaps we have another challenge and goal for Tammy: she’d very much like to see the creation of an Artist Internet Sales Forum that provides similar exposure for artists without the listing fees, rules and expenses attendant with the current internet sales outlets. While it usually costs money to make money, the computer intermediaries are attaining thicker pocketbooks than the artists are. That may always exist; I say - Dream Large! Congratulations, Tammy Martin, on being chosen a Wool Gathering Featured Artist!